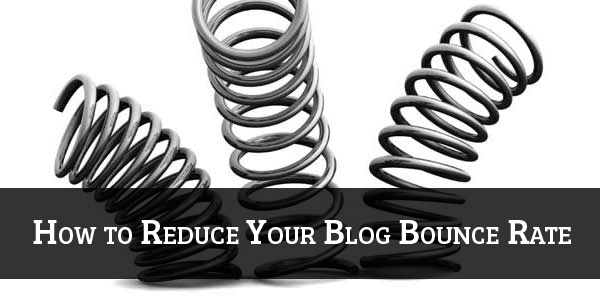 How to Reduce Your Blog Bounce Rate? Every blog that exists on the blogosphere has some motive behind it. Some bloggers may want to share their ideas with the world, some just want a medium to write, and few write on a mission to help others with their own experience. However, there's one thing common between the blogs i.e. to attract as many as visitors to the blog. So, what do you do to reduce the bounce rate? i.e. the number of people leaving the blog. Try some tips and tricks to make your blog more practical and useful to the visitors. Improve the blog quality to persuade people to spend time on your blog. Each and every single visitor is important and valuable for your blog and your blogging business. Mentioned below are few tips, which might be useful to make your blog effective and valuable for your visitors. In order to reduce Bounce rate of your blog, the first thing you need to make your blog user friendly. A well user friendly blog gets more reader attention and they want to spend more time over there. Make navigation system of your blog simple. This will make it easier for your blog readers to get easily, what they are searching for. If you want your blog visitors to read your blog post and spent time on it, you must write your blog post simple and use clear titles for theme. Try to write in simple English, Provide information in simplest way, use relevant images in your post. Interlinking of your blog post is best way to reduce bounce rate of your blog. It will not only improve your blog bounce rate but also helps your blog SEO by passing link juice and anchor text benefits. It helps your blog readers to read another article on your blog. They like to click internal links on blog post to read many other related articles of your blog. It’s good to interlinking your blog post, but don’t put too many links for the sake of interlinking. It’s good idea to stop your blog visitor for some more time on your blog. It just gives your visitor a sort menu to your relevant blog posts. It lets your visitor to read more articles under same category by just clicking on a category or tag link. So it’s always a good idea to use relevant categories for your blog post. Make your blog load faster. To speed up your blog, make your blog design simple, use the latest technology in your blog, you can also use CDN plugins for that. Your blog should load in fractions of seconds. Make sure your blog code is clean and clutter free. So, these are the best tips to improve your blog’s bounce rate. Hope you like it. What other way, you use to reduce your blog bounce rate? If you have something to add to the list, then share if via the comment box below. Chiranjeev kumar is a Tech Blogger from India. He writes mostly about Blogging, How to Guides, SEO, Blogging, Blogger, WordPress, Technology and Social media at TechClause. Visit Techclause.com to know more about me. Great tips Chiranjeev bro to make blog sticky for readers. It is always a good idea to work on blog bounce rate for blogging success. All points are really worthy the most important is site speed.... nice tips mate !